This work focuses on the study of the formation of amorphous silicon clusters embedded in SiNx thin films prepared by low-pressure chemical vapor deposition technique at a temperature of 1023 K by using a mixture of silane (SiH4) and ammonia (NH3). The deposition process is modeled via kinetic Monte Carlo simulation on a triangular lattice. The distribution of ammonia molecules in the simulation matrix is described using our previous pattern. This pattern includes adsorption and migration microscopic processes. The influences of the NH3/SiH4 gas flow ratio and the deposition time on the deposition kinetics are analyzed. The obtained results describe well the different stages of the nitrogen doped silicon deposition process. Indeed, an increase in the gas flow ratio leads to the formation of a high density of smaller amorphous silicon clusters. Moreover, larger clusters can be formed by increasing the deposition time. Simulation results are also compared to our previous results to better understand, on the one hand, the interest of using disilane instead of silane in order to make such deposits, and on the other hand to evaluate the role of ammonia in the SiNx film deposition process. Recently, considerable attention has been devoted to silicon nanocrystals (Si-nc) from both the experimental and the theoretical perspectives [1-4], due to its potential nanoelectronic and optoelectronic device applications as well as their interesting physical properties. Many researchers have investigated the production of the light emission from Si-nc embedded in silicon (Si) oxide films [5,6]. Indeed, silicon oxide presents a low efficiency of carrier injection owing to its too large barrier height, which reduces the properties of the devices. In order to increase the injection efficiency of carriers, SiNx thin films have attracted a great deal of attention, as they have a lower barrier height than silicon oxide. In general, there are two methods used for the formation of silicon nanocrystals, one is the crystallization of nitrogen doped silicon (SiNx) films  and the other is direct deposition . Various fabrication techniques, such as plasma-enhanced chemical vapor deposition (PECVD) [2,8], low-pressure chemical vapor deposition (LPCVD) , and catalytic chemical vapor deposition (Cat- CVD)  have been examined for the fabrication of Si-nc in SiNx thin films with different silicon sources; i.e. SiH4 [1,2,8] and Si2H6 . In preparation of SiNx films, various deposition process parameters have a strong influence on the structure and morphology as well as properties of the films [4,7]. Some of the reports [4,7] indicated that both the size and density of Si crystallites could be controlled by the substrate temperature. Consequently, the simulation of the deposit step plays an important role in defining the required properties of the obtained films. In a SiNx thin film deposition process, the obtained film is automatically shaped by microscopic random processes (e.g., adsorption, desorption, migration, and surface reactions) . Indeed, a good control at the nano- and micro-scale of the film growth process is critical to the performance of materials. Therefore, it is necessary to understand and control the microscopic processes that describe nitrogen doped silicon film deposition. Kinetic Monte Carlo (KMC) methods have been widely and successfully used to simulate thin film microscopic processes as well as the influence of deposition parameters on the evolution of film microstructure, since they can describe the different stages of the film growth process and contain the surface morphology information . In this work, we investigate via the KMC method the influence of deposition parameters, namely gas flow ratio and deposition time, on the deposition kinetics of nitrogen doped silicon films deposited by LPCVD technique from silane (SiH4) and ammonia (NH3). We focus on a SiNx thin film deposition process governed by two microscopic processes including particle adsorption and migration. In order to simulate this process, the distribution of the NH3 molecules in the simulation matrix is described using our previous simulation pattern . Kinetic Monte Carlo is a good tool to study the evolution of systems at the nano- and micro-scale. KMC methods arise naturally in the modeling of the surface morphology evolution of thin films in many deposition processes, such as the LPCVD process of nitrogen doped silicon films . In this section, a SiNx thin film deposition process is described and modeled on a two-dimensional triangular lattice via KMC methods. The thin film deposition process considered in this work includes two microscopic processes: particle adsorption and surface migration. Figure 1: Schematic design of the deposition process of a SiNx thin film . A: SiH2 (SiH4) site enclosed by NH3 molecules in all directions. B: SiH2 (SiH4) site having less than six nearest neighbors. C: SiH2 (SiH4) site enclosed by SiH2 radicals and/or SiH4 molecules in all directions. where dV0 parameter depends only on the deposition total pressure P and on the wafer-to-wafer distance δ, Ea= 1.5 eV  represents the deposition activation energy, KB is the Boltzmann constant, and T is the deposition temperature. We consider two types of microscopic processes (Monte Carlo events in the KMC simulation) taking place in the deposition process of SiNx films: an adsorption process and a migration process. In the adsorption process, incident molecules and radicals are incorporated into the SiNx thin film from the gas phase. However, in a migration process, Si adatoms on the thin film move to their adjacent vacant sites. where υ0 is the pre-exponential factor, E0 represents the contribution to the activation energy barrier, and ni is the number of the nearest neighbors of the ith silicon adatom. Note that the migration rate is zero when ni=6 since this Si adatom is fully surrounded by other adatoms and cannot migrate. Calculation of the migration rate necessitates selection of the parameters υ0 and E0 in eqn. (2). In this work, υ0 and E0 take the following values 1013 s-1 and 0.6 eV, respectively . In this paper, the KMC method is used to simulate the deposition process of SiNx thin films due to its high efficiency in simulations of the process of chemical vapor deposition, which involves the adsorption, desorption, migration, and surface reactions . According to the KMC method, a list of events is created for all possible events including adsorption and migration  and the events are executed instantaneously upon selection. During the simulation, sites for deposition and migration are chosen randomly in the simulation lattice, in such a way that individual events are separated . 1. A triangular lattice (N=40,000) representing the surface structure of the film is considered. 2.Form a list for all possible events including adsorption and migration. 3. Select a random number in order to determine the type of the next event whether it is an adsorption event (0<μ< Vd) or a migration event where M is the total number of Si adatoms on the lattice at the specific time instant. 4. Execute and carry out the selected event from the list of events formed in step 2. 5. Select a new random number σ ∈ [0,1]. 7. Return to step 2 until the preset deposition time has been reached. During the thin film deposition process, the microstructure of a SiNx film is the result of a complex interplay between adsorption and migration processes. Motivated by this consideration, this work focuses on the study of the formation of smaller amorphous silicon clusters in a SiNx matrix. For this, a SiNx thin film deposition process which involves molecules and radicals adsorption and Si adatoms migration is considered and is modeled using a triangular lattice-based KMC simulation. The distribution of NH3 molecules in the simulation matrix is described using our previous approach . In fact, for a randomly selected site from the matrix to be occupied by a SiH2 radical (or a SiH4 molecule), the neighbor sites are reserved for NH3 molecules (Figure 1) that allows for SiNx thin film growth. Thus, the SiH2 radicals and SiH4 molecules are surrounded by NH3 molecules in all directions, thereby allowing the formation of smaller amorphous silicon clusters. Furthermore, by increasing the number of NH3 molecules in the simulation matrix, a nitrogen (N) compound is created with the formation of strong Si–N bonds. Using this model, the deposition process of smaller amorphous silicon clusters can be simulated using the KMC method . It can be seen from these equations that, on the one hand, each SiH4 molecule promotes the deposition of a Si atom into the SiNx film thanks to either the dissociative adsorption of SiH4 (eqn. (4)) or SiH2 (eqn. (5)) or SiHNH2 (eqn. (9)) species on the simulation matrix and, on the other hand, each NH3 molecule ensures the deposition of a N atom into the obtained film thanks to either the dissociative adsorption of SiHNH2 (eqn. (9)) or NH3 (eqn. (10)) species on the matrix. For no NH3 flows, Si films are deposited thanks to both SiH4 and SiH2 species (eqns. (4) and (5)). However, for low flows of NH3 in comparison with the flows of SiH4, NH3 molecules react with both SiH4 and SiH2 species to form SiH3NH2 and SiHNH2 radicals in the gas phase (eqns. (6)-(8)). In fact, the adsorption of SiH4 (eqn. (4)) and SiH2 (eqn. (5)) is high compared to the adsorption of SiHNH2 (eqn. (9)) and NH3 (eqn. (10)), which corresponds to the case of nitrogen doped silicon thin films. In this case, the density of Si–N bonds is negligible in comparison with that of Si–Si allowing the deposition of larger silicon clusters. Finally, for high flows, NH3 has opposite influences on the formation kinetic of amorphous silicon clusters. Indeed, NH3 controls completely the deposition process of films. Moreover, the adsorption of SiH4 (eqn. (4)) and SiH2 (eqn. (5)) is insignificant in comparison with that of SiHNH2 (eqn. (9)) and NH3 (eqn. (10)) leading the deposition of silicon nitride (Si3N4) films. Thus, more N-containing species are available in the lattice. Therefore, the formation of Si–N bonds is naturally favored over that of Si–Si. In fact, the presence of strong Si–N bonds impedes the coalescence of smaller silicon clusters into larger clusters. In this work, the LPCVD process of SiNx thin films was simulated by using the KMC method. A mixture of SiH4 and NH3 was used as the source gas. The gas flow ratio R (defined as R=f(NH3)/f(SiH4) where f(NH3) is NH3 flow and f(SiH4) is SiH4 flow) and the deposition time (tKMC) were chosen to be the main influent parameters. During the deposition process, the deposition temperature T and the total pressure P were, respectively, fixed to 1023 K and 26.66 Pa. In this section, in order to study the influence of the gas flow ratio on the LPCVD process of amorphous silicon clusters embedded in SiNx thin films, eight values of this input parameter were used (0, 0.26, 0.36, 0.50, 1, 1.2, 1.4, and 1.6). All Deposits were carried out at a deposition duration (tKMC) of 2 h. The KMC simulation results are shown in Figures 2-4. Figure 2: Variation of the percentage of the surface coverage of SiNx thin films as a function of the gas flow ratio R with N=40,000, tKMC=2 h, T=1023 K, and P=26.66 Pa. Figure 3: Surface structure evolution of SiNx thin films as a function of the gas flow ratio R with N=40,000, tKMC=2 h, T=1023 K, and P=26.66 Pa. The black color represents the amorphous silicon clusters while gray color is for regions occupied by nitrogen. Figure 4: Variation of amorphous silicon cluster size and density as a function of the gas flow ratio R with N=40,000, tKMC=2 h, T=1023 K, and P=26.66 Pa. 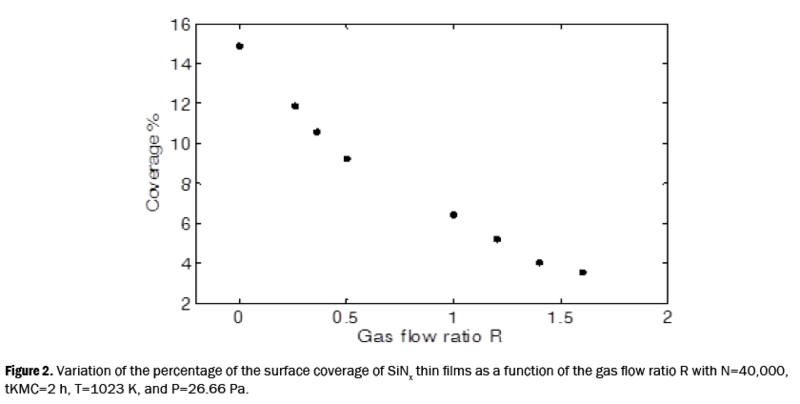 Figure 2 represents the variation in the SiNx film surface coverage as a function of the NH3/SiH4 gas flow ratio R. Indeed, an increase in the gas flow ratio leads to a decrease in the surface coverage of the obtained films, as clearly shown in Figure 3. Figure 3 shows the surface structure of the SiNx thin films according to the gas flow ratio R for a deposition temperature of 1023 K. Thus, an increase in R provokes a decrease in the size of amorphous silicon clusters along with an increase in their density, as shown in Figure 4. The size of amorphous silicon clusters is observed to decrease from 0.85 nm to 0.28 nm whereas their density increases from 5 × 1012 clusters/cm2 to 1013 clusters/cm2 as R goes from 0 to 1.6. From these results, it is clear that nitrogen in silicon influences considerably the internal microstructure during the film deposition phase. In fact, the presence of strong Si–N bonds prevents the coalescence of smaller amorphous silicon clusters into larger clusters. Several authors have shown that NH3 gas has a crucial role in the deposition process of SiNx thin films [14,15]. Compared to our previous work  in which SiNx thin films were deposited by LPCVD technique from Si2H6 and NH3, the role of NH3 was reduced thanks to the silicon excess in the matrix came from the use of Si2H6 as the source gas. During the simulation, the SiH2 radicals (SiH4 molecules) must be surrounded by NH3 molecules in all directions; consequently, the formation of smaller amorphous silicon clusters can occur. Hence, a nitrogen compound is created with the formation of strong Si–N bonds in the lattice. Therefore, the simulation pattern describes well the formation of smaller amorphous silicon clusters by the use of SiH4 and NH3 as the source gas. A series of eight SiNx thin films was prepared by LPCVD technique from SiH4 and NH3, whereas the deposition time (tKMC) was chosen to be the main parameter. All films were grown using different values of this input parameter, while keeping all other input parameters the same (T=1023 K and P=26.66 Pa). The flow rates of NH3 and SiH4 were fixed at 36 and 100 sccm, respectively. The KMC simulation results are shown in Figures 5-7. Figure 5: Surface structure evolution of SiNx thin films as a function of the deposition time (tKMC) with N=40,000, R=0.36, T=1023 K, and P=26.66 Pa. The black color represents the amorphous silicon clusters while gray color is for regions occupied by nitrogen. Figure 6: Variation of the percentage of the surface coverage of SiNx thin films as a function of the deposition time (tKMC) with N=40,000, R=0.36, T=1023 K, and P=26.66 Pa. Figure 7: Variation of amorphous silicon cluster size and density as a function of the deposition time (tKMC) with N=40,000, R=0.36, T=1023 K, and P=26.66 Pa. Figure 5 shows the surface morphology of the SiNx thin films prepared with different values of tKMC. Indeed, an increase in tKMC causes an increase in the surface coverage of SiNx thin films, as clearly shown in Figure 6. Qualitatively, this relationship between the deposition time and the morphology of the SiNx thin films has been demonstrated via the work of Karabacak et al. . This work reported that the surface morphology of amorphous silicon nitride films prepared by plasma-enhanced chemical vapor deposition technique enlarged with the increase in growth time. With the increase of deposition time from 15 min to 6 h the density of amorphous silicon clusters increases, reaches its maximum at 4 h and then decreases, whereas their size increases from 0.1250 nm to 0.7800 nm with increase of tKMC, as shown in Figure 7. From the same KMC simulation results, we have also observed that at the initial stage of deposition a number of smaller amorphous silicon clusters starts to form. With the increase of deposition time, a high density of smaller amorphous silicon clusters allows them to join together to grow, through the coalescence phenomenon. In fact, when two Si clusters exist closely, they can be connected via the formation of Si–Si bonds necessary for the coalescence of smaller silicon clusters into larger clusters. Finally, our KMC simulations clearly demonstrate that the deposition time is mainly responsible for the big variation of the SiNx film surface morphology. During the simulation, the increase of the deposition time leads to the deposition of a high density of smaller amorphous silicon clusters in the simulation matrix. Next, larger clusters are formed through the coalescence of smaller Si clusters on the one hand and the migration of Si adatoms on the other hand. Consequently, the deposition time is an important parameter to control both the shape and size of amorphous silicon clusters during the deposit phase of SiNx films. In this work, the formation of smaller amorphous silicon clusters was studied for a SiNx thin film deposition process modeled via KMC simulation on a triangular lattice with two microscopic processes. A mixture of SiH4 and NH3 was used as the source gas. The distribution of ammonia molecules in the simulation matrix was described using our previous pattern. The NH3/SiH4 gas flow ratio and the deposition time were chosen to be the main influent parameters. The results indicated that an increase in the gas flow ratio allowed the formation of a high density of smaller amorphous silicon clusters. Moreover, larger clusters could be formed by increasing the deposition time. Finally, the use of SiH4 as the source gas in the presence of NH3 slowed the deposition of films. Lee KM, et al. Size control of silicon nanocrystals in silicon nitride film deposited by catalytic chemical vapor deposition at a low temperature (≤200°C). Scripta Materialia 2009;60:703-705. Zerga A, et al. Si-nanostructures formation in amorphous silicon nitride SiNx:H deposited by remote PECVD. Physica E 2007;38:21-26. Bouhadiche A, et al. Monte Carlo simulation of silicon nanocrystal formation in the presence of impurities in a SiNx matrix. Computat Mater Sci 2014;92:41-46. Bouhadiche A, et al. Kinetic Monte Carlo simulation of low-pressure chemical vapor deposition of silicon nitride: Impact of gas flow rate and temperature on silicon cluster size and density. Mater Sci Semiconduct Process 2014;26:555-560. Daldosso N, et al. Silicon nanocrystal formation in annealed silicon-rich silicon oxide films prepared by plasma enhanced chemical vapor deposition. J Appl Phys 2007;101:113510. Yuan Z, et al. Silicon nanocrystals as a photoluminescence down shifter for solar cells. Sol Energ Mater Sol C 2011;95:1224-1227. Sain A and Das D. Tunable photoluminescence from nc-Si/a-SiNx:H quantum dot thin films prepared by ICP-CVD. Phys Chem Ch Ph 2013;15:3881-3888. Wang M, et al. Photoluminescence of Si-rich silicon nitride: Defect-related states and silicon nanoclusters. Appl Phys Lett 2007;90:131903. Huang J, et al. Porosity control in thin film solar cells. Chem Eng Sci 2013;94:44-53. Temple-Boyer P, et al. Influences of deposition and crystallization kinetics on the properties of silicon films deposited by low-pressure chemical vapour deposition from silane and disilane. Thin Solid Film 2010;518:6897-6903. Hu G, et al. Stochastic modeling and simultaneous regulation of surface roughness and porosity in thin film deposition. Ind Eng Chem Res 2009;48:6690-6700. Keršulis S and Mitin V. Monte Carlo simulation of growth and recovery of silicon. Mater Sci Eng B 1995;29:34-37. Hu G, et al. Modeling and control of film porosity in thin film deposition. Chem Eng Sci 2009;64:3668-3682. Temple-Boyer P, et al. Properties of nitrogen doped silicon films deposited by low-pressure chemical vapor deposition from silane and ammonia. J Vacuum Sci Technol A 2000;18:2389-2393. Temple-Boyer, et al. Residual stress in low pressure chemical vapor deposition SiNx films deposited from silane and ammonia. J Vacuum Sci Technol A 1998;16:2003-2007. Karabacak T, et al. Growth front roughening in silicon nitride films by plasma-enhanced chemical vapor deposition. Phys Rev B 2002;66:075329.